As a painter of figurative art, it has always been far easier for me to create art than to talk about it. Emotions of everyday life are the initial impulses for creating my compositions. I also receive inspiration from masterpieces of classical art, especially from the Northern Renaissance pictorial traditions. Although these influences are very important for me, the invention of my own artistic style and pictorial language is the main objective of my creative process. Throughout life, each person is impacted by the surrounding world and its historical, cultural, spiritual and existential contexts. Yet, the artist tries to analyze these interesting aspects of existence and find the reflections of essence of a human being by means of visual forms. I strongly believe that this visual language is self-sufficient by itself and does not need any verbal interpretations. There is only one important thing – the craftsmanship of the interpretation of visual forms. In the works below, I was concerned with the development of my visual language (artistic style), in order to fully express my attitude towards the themes of compositions. 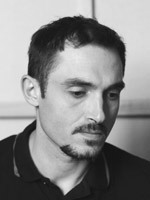 The viewer can evaluate if I have succeeded or not, since the artist's attitude to his own art is not always objective. 1. 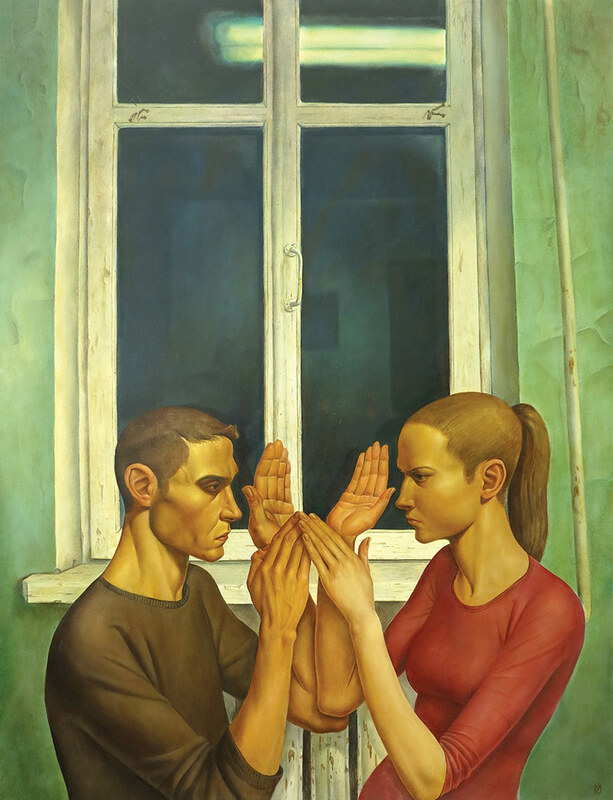 The "Conflict" represents the game between a man and a woman, turning into a confrontation. However, there are noticeable references to “prayers under the crucifixion” in their poses and their hand positions. The frame of the window above them resembles an empty cross - The Messiah has risen and prayers seem to be playing the game of "Ladushki", the essence of which is to confuse the opponent and become a winner. The light reflected in the window and the nails on the frame symbolize some higher force that has brought the figures here and then left them alone. 2. 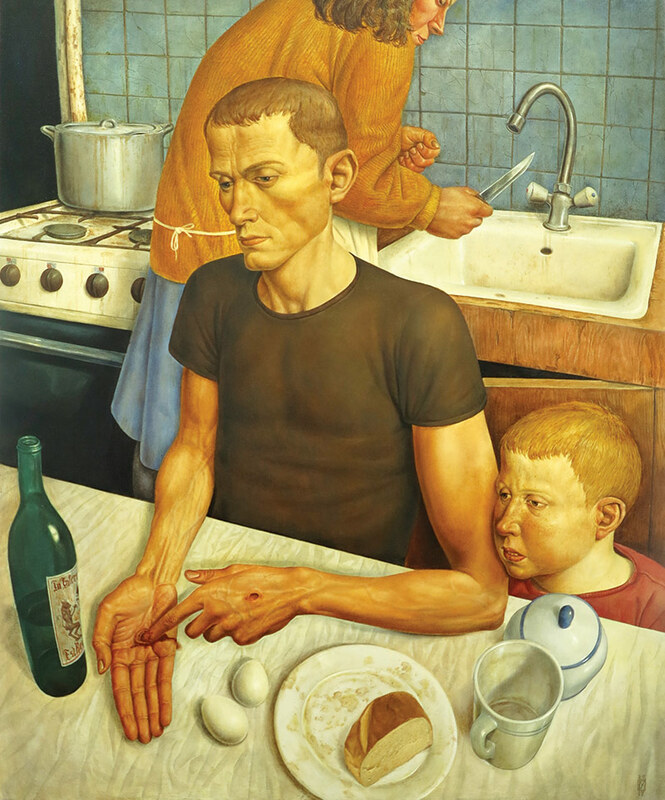 In "Stigmata" we see a certain family sitting in their kitchen – a man, woman and a child. The man is marked by the Savior's wounds, but it is obvious, that this is not the Christ. Judging from the composition it could be the husband, the brother or the son of the woman who is doing her every day kitchen tasks. The attitude of the protagonist (the man) to stigmata is not more serious than to a usual skin ailment. The woman behind him is indifferent to what is happening, but the knife in her hand makes this character a symbol of hidden aggression. The boy embodies the banal curiosity, his closeness to the sugar bowl and an empty cup emphasizes a specious falsity of the situation. In the foreground there are the symbols of the sacrament: wine and bread, but the wine is colorless and looks more like vodka and the bread is lying on a dirty plate. The background represents the elements that are used to punish sinners. Fire – a gas stove and a saucepan speak about the throes of hell. The kitchen sink refers to the Noah’s Flood. The cracked tiles speak about the dying earth, and the household gas symbolizes the poisoned air. 3. "Sanctuary" is a free interpretation of "The Temptations of St. Anthony". 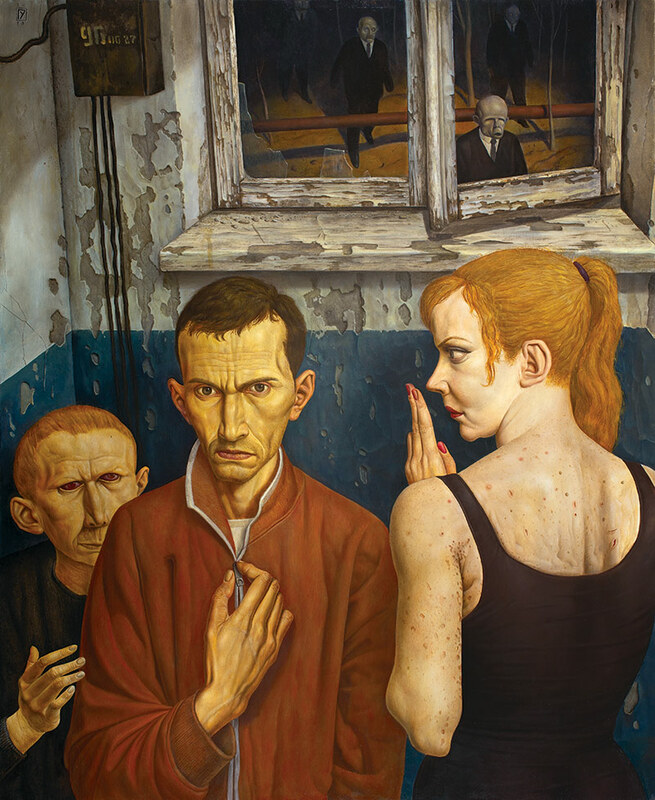 We see a man who has driven himself into the corner of the room to escape from demons, but there is a child who looks like an old man already waiting for him and a pretty faced lady who appears to be rotting from the back. The boy, with an old man's face, does not allow to think about the safety of an asylum. In this shelter, the windows are broken, the walls are crumbling and deteriorating, and the viewer can see through the window strange creatures coming towards the shelter which resemble the living dead. Escaping from an external threat, this hero is faced with no less danger inside. Another theme that goes through these paintings is loneliness. All these heroes, in the attempt to communicate with someone, acquire only suffering. It remains to quote Maupassant: "In the eternal desire to merge together, we only hit ourselves against each other".